This Pro skipping rope has large, foam grip handles for easy grip. With in-built swivel and weights in both handles, this skipping rope is durable and fast. Swivel: In-built ball-bearing swivel for high-speed skipping. Handles: solid grip with contoured foam cover for comfortable and slip-resistant grip. Weighted Handles: Each handle contains a removable 200gm steel bar. Simply screw the handle off to add/remove the steel weight. Rope: Leather, tough leather with outstanding speed ability. Material: handles are plastic with foam grips. 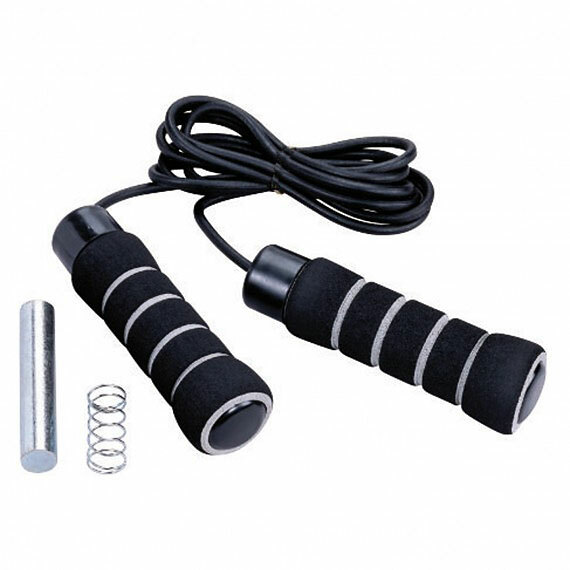 Buy Pro Skipping Rope with Grip Handles from Fitness Market and save! With our efficient dispatching and quick delivery throughout Australia, Pro Skipping Rope with Grip Handles can be yours sooner. Below you can rate and add reviews for Pro Skipping Rope with Grip Handles. The foam handles are okay. I do not like the pvc rope, it is too long and still has folds in it from the packaging.